Who knew winter produce could look this good?! 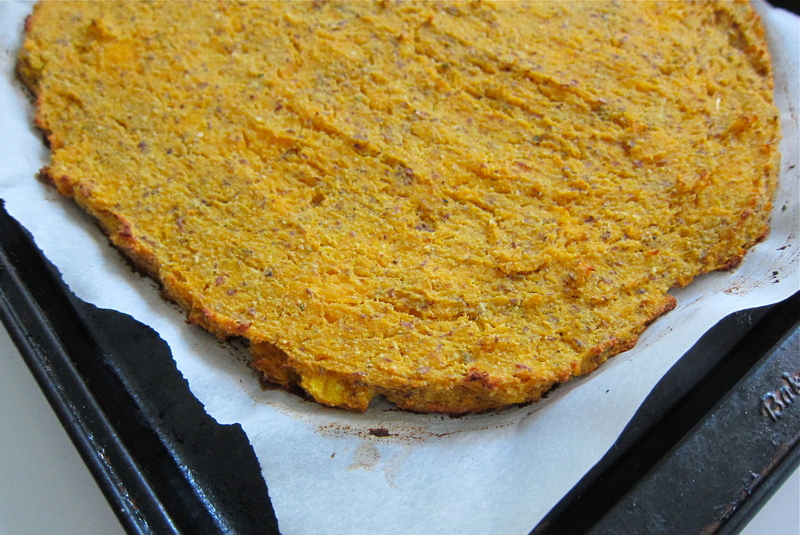 The squash-crust consists of mashed butternut squash, almond flour, chickpea flour, and ground flaxseed. Everything gets mixed together and spread out onto a parchment lined baking sheet. The crust bakes for about 35 minutes. 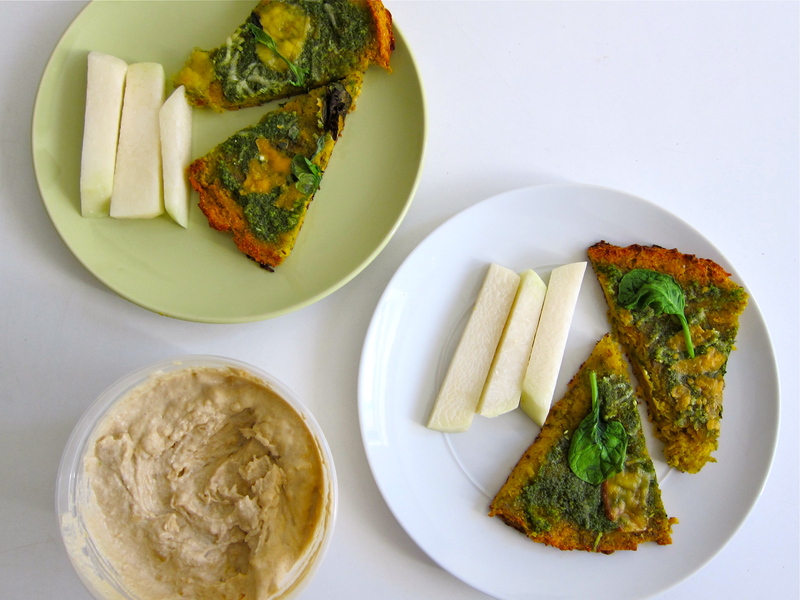 The crust ingredients are full of fiber, healthy fat, and protein to keep our bodies satiated and healthy. Such a nice bright orange color from the squash. 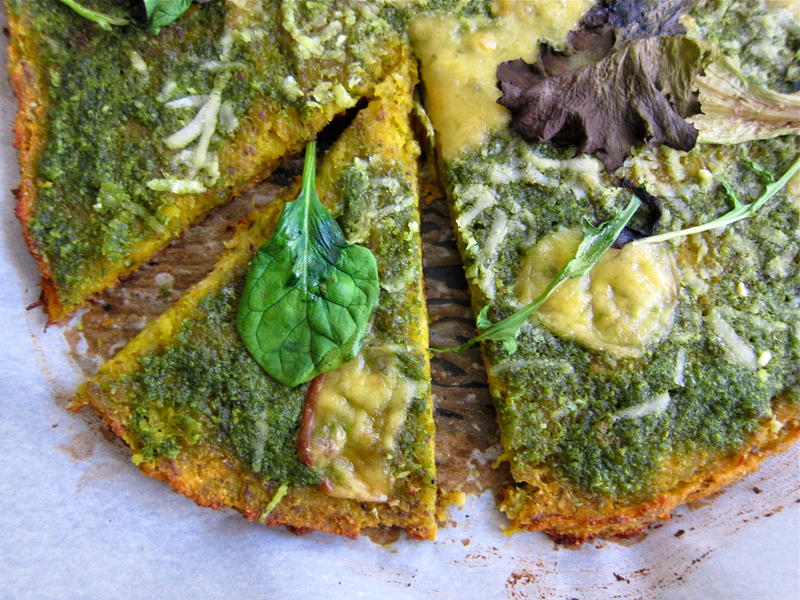 I spread homemade basil pesto (made with hydroponic basil from the Corbin Hill farm share) over the baked crust, along with grated Parmesan cheese and a few slices of smoked gouda that I tore into big pieces. Back into the oven for another 10 minutes to warm everything through and melt the cheese. Want to keep things vegan? Skip the addition of Parmesan to the pesto, skip the extra cheese on top of the pizza, and add extra vegetables and nuts for toppings. 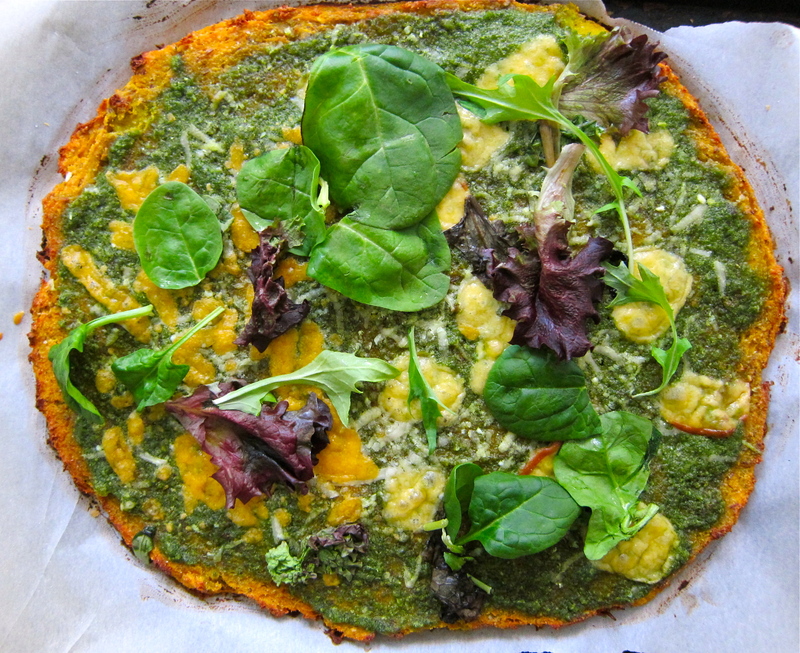 Top the baked pizza with a few sprigs of salad greens to make it look extra pretty and to add an extra veg. 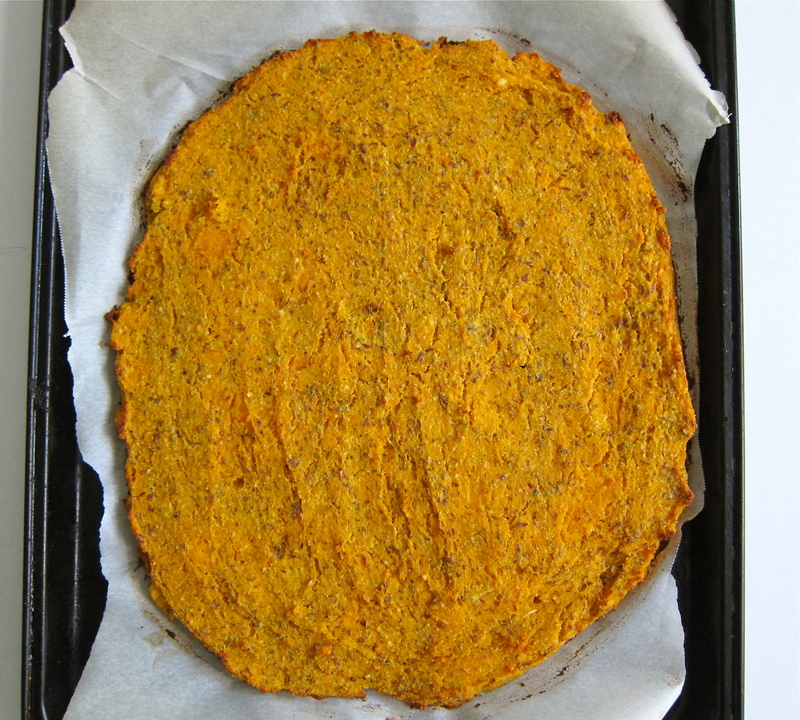 This is definitely not a traditional pizza pie, but the squash-crust variation is fun to make and delicious in a whole new pizza pie way. Leftovers reheat nicely in the oven or toaster oven. To roast the squash (can be done ahead of time i.e. the day before): Preheat the oven to 400 degrees F. Cut the squash into quarters and scoop out the seeds. Rub the cut sides with a little bit of olive oil. Roast in the oven for 40 minutes to an hour (flip the squash over midway through) or until a fork can easily pierce the flesh of the squash. Let cool slightly, then scoop out the flesh and mash slightly with fork. To make the crust: Preheat the oven to 425 degrees F. In a small bowl combine the 2 tablespoons of ground flaxseed with 4 tablespoons of water. Let sit for 5 minutes. In a larger bowl combine the 3 cups of mashed squash with the soaked flax meal, almond flour, garbanzo flour, salt, pepper, dried oregano, and extra ground tablespoon of ground flaxseed. Stir to combine. Spread the mixture onto a parchment lined tray and create a 12-inch circle with your fingers, a spoon, or a spatula, leaving the edges slightly thicker. Bake for 30 to 35 minutes or until the edges are crisp and golden and the centre is set (and can easily peel away from the paper). 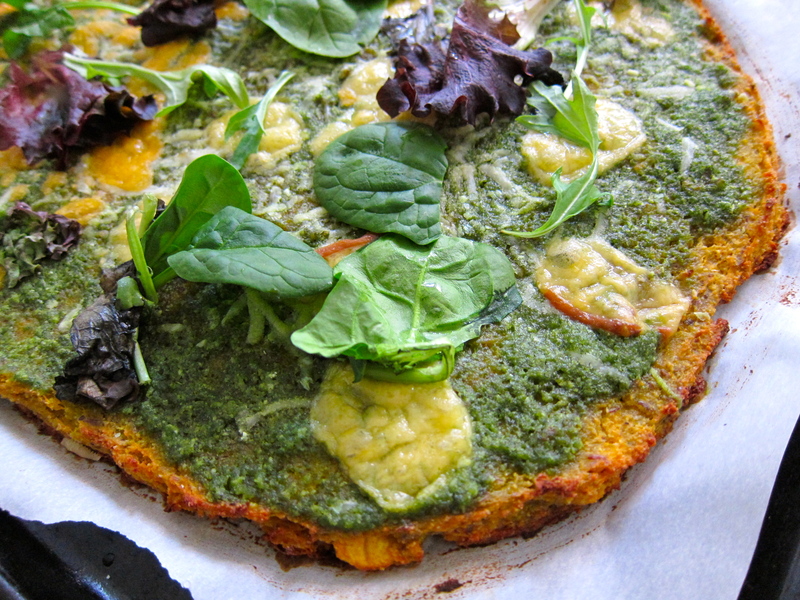 Top the pizza crust with pesto (recipe below) or tomato sauce, cheese and any other toppings of choice (extra vegetables, meat, etc.) and bake for another 10 minutes. Let the pizza sit a few minutes and garnish with salad greens. **NOTE: Pesto freezes nicely as long as it is frozen without the cheese. To thaw frozen pesto, place in the refrigerator the morning or night before you want to use it. Once thawed, stir in grated Parmesan cheese. In a food processor or blender, combine all of the ingredients except the Parmesan cheese. Scrape down and pulse again until everything is nicely chopped and emulsified. Add the Parmesan cheese. Spread finished pesto atop pizza, mix it into fresh pasta, enjoy on a sandwich, or drizzle over vegetables or meat. Thanks, Jacki. I caught a glimpse of natural daylight! I was thinking of that pesto video you sent me when I was making the pesto. I got lazy and used my blender, though ha.